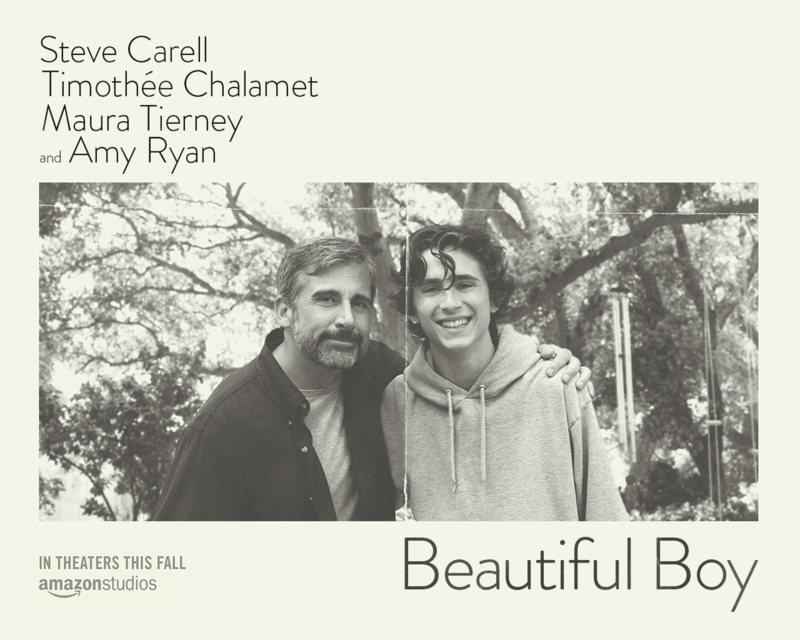 Grappling through the dark depths of addiction, Beautiful Boy (R) is a disturbing yet enlightening film. Nic Sheff, as played by Timothée Chalamet, is a young adult who struggles with a methamphetamine addiction, trying to find his way through his seemingly normal life, until it becomes completely dominated by the use of drugs and alcohol. While he deteriorates as an effect of increased drug usage, his father, David, played by Steve Carell, struggles to cope and understand what his son is going through. He desperately searches for answers, and researches until he can’t any longer. He cannot reason why Nic would do this to himself, and he wants to help him before he ruins his life. The audience is given a sense of hope when Nic is first brought to a rehab center, and he seems to be realizing what the drugs are doing to him. Yet, it seems almost naive to believe the story could end there with a happy ending — unlike most stories of addiction. As predicted, Nic later relapses multiple times, and each new time, it is more and more frustrating. He seems to be doing well in college, until one day he takes out his spoon and box, and you can figure out what comes next. It made me so mad at his character, so disappointed in Nic as I watched the graphic scene in which he injects himself with the full syringe. I think it was necessary to include, it’s meant to be uncomfortable, because if they didn’t show it, you wouldn’t feel the need to want to do anything to stop it from happening. It was the kind of scene that makes you squirm in your seat, it was so disgusting. But, I think Chalamet did a perfect job of capturing the casualness of drug use, and how it can take place virtually anywhere. He continues functioning in school even while using, but as he visits his father at home, he is confronted and again goes in for treatment, which I expected to happen, because Carell captured the same anger that David felt for Nic each time he relapsed. Although we learned in the beginning he was addicted to one of the strongest stimulants there is, there was this hope in the back of my mind that in one of the scenes he would realize how it is hurting himself and others around him — like his father. But, each time he takes a step forward, he takes two more backwards, and all progress is lost. The entire film he is trapped in a terrible cycle of recovery and relapse, all the while his father watches helplessly. As an audience member, I felt just as helpless, because Nic made me want to get rid of all syringes in the world so he could never do such a thing again. For those who have read the book, released 2008, featuring the true story of Nic Sheff, written by his father, David, they can also see that the sequence of events in the film follow very closely in detail. For the first half of the film, I was not very affected by the scenes illustrating him using, such as in college or on the streets with other people, like Lauren, but at the very end, I became very emotional at the scene of him lying on the bathroom floor. The director was able to effectively convey an overdose, focusing on his twitching body, and not his face. I think they chose not to show the face until later in order to capture him in a different way, instead of just some addict, he has reached his last resort, and come to his final breaths, giving the audience a feeling of desperation, making you want to scream out and help him. He is alone, helpless, and near death; he’s no longer a boy but a zombie, with the last of his life leaving his eyes, and Chalamet displays himself as just that. In that moment I thought he wasn’t coming back at all. He had no one left to turn to, even his father had told him that he could no longer save him. That specific scene was just so heartbreaking, but so important, because he as he takes you into the moment with him, you feel just as hopeless. It highlighted a very common problem in our society today. Addiction is a very real thing, and it can take from anyone, creating total chaos and destruction in one’s life. Although he is near death, he eventually recovers, and the final scene is him and his father sitting together at the rehab center, which gives the audience a comforting ending, yet it still remains unresolved. According to the note displayed on a black screen following the closing scene and alluding to the credits, he does become sober for eight years after, which is inspiring and provides a sense of hope for people who believe they have none left. If the film taught any lesson, it would be that no matter what type of struggle you are going through, someone will be on the other side to get through it with you. Overall, it took the cliche theme of overcoming obstacles and gave a situation that doesn’t always have a happy ending. Nic was very lucky to survive with all of the drugs infiltrating his system, and even though his character makes decisions that make you question his thought process, and even become angry with him, you still have a chance to see that other side of the story, of the addict. I believe the movie gave a very realistic depiction of addiction, and it even included all of the specific details that describe a meth addict – the torn lips, decaying teeth and hollowing body. Chalamet perfectly portrayed this skeleton-like character, and brought the audience through Nic’s true story. In contrast with Chalamet’s Oscar-nominated film, ‘Call Me By Your Name,’ his small and scrawny frame seems like a normal boy shape. But here, the small, decaying frame is unhealthy looking and appears disturbing as we see the effects of the addiction. The movie sheds light on a topic that is so taboo to normally talk about, yet so common. One point two million. That is the amount of people per year in the United States that have admitted to using methamphetamine at least once, according to the National Institute on Drug Abuse. Not only are millions of people using, but thousands are dying from it, which is why showcasing this film is so necessary. Instead of ignoring the current addiction problem in our country, let’s raise awareness and get help when we actually need it. If you enjoyed the movie, or would like to know more about the real story, Nic Sheff has a memoir released called Tweak, in which he talks about his addiction and how he got through it. Nowadays many films are focused on imaginary stories and light hearted comedies, but maybe the type of films we need to be watching are the ones that make us take a step back and reevaluate our own lives, no matter how depressing they may be. In the end, the reason these films hit us so hard are because they reflect our own lives, which we don’t always like to think about. The casting department in charge of this film deserves to win an award all on their own, partly because they chose to cast some of the most influential actors of this era to play out these lead roles. Steve Carell, for example, is very popular for a middle-aged actor, but because of his main role in ‘The Office,’ he now appeals very much to the younger generations as well. On the other hand, Timothée Chalamet is the ideal Nic Sheff, because he is quickly climbing the ranks of Hollywood and continuing to prove to us as an audience why we keep watching his films. It was very clever on casting’s part to choose these two to carry out such an important message to us all. Since they are so influential, people are going to want to listen and do more to seek help for our country’s problem with addiction. Much of the film takes place in the heart of San Francisco, in the Marin County area. The audience will be able to recognize several famous places in the film, like the Golden Gate Bridge. In fact, it’s very similar in nature to Rocklin, as Nic came from a good family with several resources and money available while in high school. He even appears to still be fully functioning while going through his senior year, a time of college applications and figuring out your life. But, he felt that he needed a way to block out some of the things going on in his life, so he felt he had no other option but to turn to these easily accessible drugs. I think the fact that it was set in a place so close to home, even for me as a student, makes me realize that that kind of thing can happen anywhere, no matter what your circumstances may be, which is horrifying to think about.